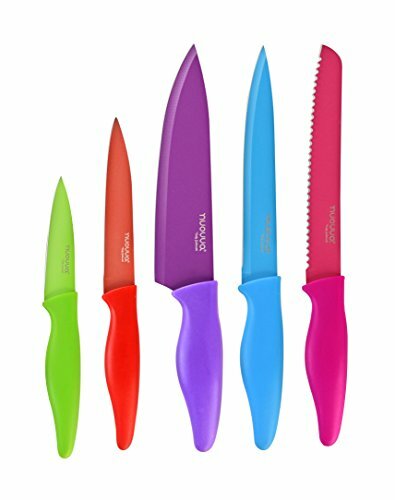 Nuovva's Coloured Kitchen Knife Set provides a customized cutting experience in an attractive package that will revolutionize the way you cook while adding a splash of colour to your kitchen! Say goodbye to your ordinary & dull knife sets with this stylish knives that will add a bit of fun to your cooking experience without sacrificing quality! Nuovva's Kitchen Knife Set is a must have staple for every kitchen that comes in a stylish and functional design. The top quality, stainless steel, coated & non-stick blades makes meal prep a breeze. They're super easy to sharpen and clean & Ergonomically designed soft touch handles for a comfortable non-slip grip ,they're resistant to wear! They're also dishwasher safe for added convenience. Our set makes an attractive display with an array of bright colours that serve a special purpose. The colour coding makes the designated use of each knife obvious at a glance & prevents cross contamination for a hygienic cooking experience. VASSORTED COLOURS: This revolutionary kitchen knife set features an assortment of colours which serves multiple purposes. In addition to looking great and adding colour to your kitchen, the colour coding prevents cross contamination. DURABLE CONSTRUCTION: This knife set was designed from top of the line materials and are high carbon stainless steel and is designed to resist wear and tear for long lasting use. Our knives are super sharp and very easy to sharpen and clean for amazing performance. VARIETY OF USES: Use these knives for just about anything from cutting meat bread and fish to chopping fruits, vegetables, herbs and even cheese! It's perfect for customized use with a wide range of foods.